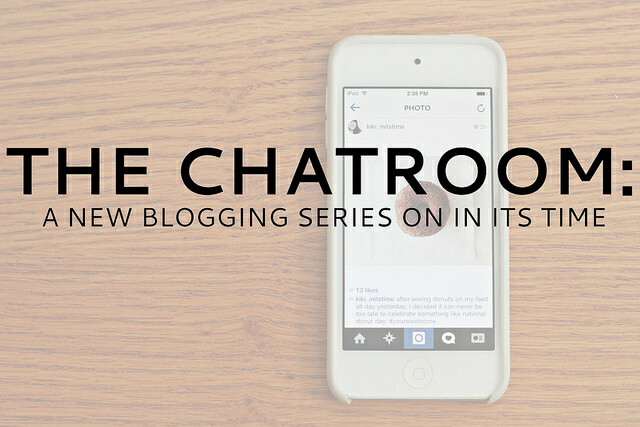 NEW SERIES: THE CHATROOM | ON HUMILITY. New series alert, friends! I've been meaning to create a new series that not only cultivates community on my blog, but in the blogging world in general. I love it when people discuss with other bloggers on my blog and I love it when I find other bloggers to follow in the comments section of blogs, too. Little known fact: that's where I'll often discover new blogs to read! So what's The Chatroom all about? Well, I hope to create an articles club of sorts. Every now and then, I'll share a blog post that resonated with me, ask you to read it, and then we'll share about our thoughts and reactions. In many respects, it's something that I already do--having been inspired by another blogger's work. My goal is that it really opens up the comments section and lets people share their thoughts and stories. And even though I know we're all adults here, all I ask is that we be respectful of everyone's (including the original blogger who wrote the post!!!) thoughts. Often times, the posts I share and then reflect upon will be posts about life, faith, and the like. And I'll only write about my own personal experiences. So there really won't be any reason why bashing will happen--but please still be kind and respectful! So here goes the first post. I came across Hayley's blog, The Tiny Twig, a few years back, but only really read it here and there. I came across this post of hers last year, but haven't really taken the time to read it with much thought until recently. So what do you think? What are YOUR thoughts on humility? To be honest, I stink at it, especially when it comes to asking/admitting I need help. My organized personality likes to do things on my own. I hate asking for help but I'll often mask that pride because I don't want to inconvenience someone and I don't want to add more to their plates. And if someone does do something for me? Then I have this internal light that flashes in my mind that I owe them; even if it was something as small as making copies for me in the copy room at work. But if humility means "the quality or state of not thinking you are better than other people", then being humble means that I'm not better than other people. And that just like everyone else, I'm not perfect. I need help, just like the next person. And even if it's hard, I need to let people help me out and admit that I can't do it all on my own. Which may be easier said than done, but it's still something that I need to say. What is YOUR definition of humility? Do you have any tips for staying humble in the blogworld and in day-to-day life? During my grad school orientation we did a rope challenge climbing course [awesome right?!] afterward we were processing and I realized I had no problems calling down to my belayer to give me slack or tighten the ropes because that's what I needed to feel secure and make it to the top of the tower. So my goal was to try to ask for what I need in every aspect of my life - especially grad school - it's so much harder to do when your not just on a ropes course but having that humility to admit I am not perfect and I need another strengths opens the door for richer community. I totally get where your coming from with the asking for help thing, sometimes it's hard for me too. I read that post about an article club last fall and LOVED the idea!!! I e-mailed several people about it and they thought it would be a good idea, but setting up discussion times/finding articles just never happened. :( Soooo. I'm super excited that you're starting this up! I'll be happy to join you! How often are you planning on hosting it? My pride manifests itself in that I like to feel/look like I have everything together. When things start to fall apart - for whatever reason - I freak. I don't want people to see my finiteness. I guess what I'm saying, is that I like to keep my weaknesses hidden. Asking for help never makes me feel weak. Getting angry, crying over silly things, getting frustrated about losing control over a situation, - those are the things that make me feel weak. Those are the moments when the ugly part of me is revealed. And that's when my pride goes on parade. I don't remember who said it, but the quote that always comes to mind is this one: "Humility isn't about thinking less of yourself, but about thinking of yourself less." To me, that is the key. When I am truly focused on God and happily/purposefully dependent on Him, my pride stays in check and humility is natural. I think the keys to humility revolve around walking WITH God and thinking like a Christian. Admitting you are wrong, is tough, isn't it?!?! Kiki has the best fonts right? I would also love to know your secrets if you're willing! Oh boy, this really resonated with me. I'm constantly struggling with trying to do it all and then feeling like such a failure when I (duh!) can't actually do it all. I have such a hard time asking for help too, and sometimes it's just because I know that person may not do things the way I want them done (control freak, party of one). And like you said, I feel like I owe someone if he/she does help me. This made me think of a sermon that I just heard at my church, and our pastor talked about how the phrase "God won't give you more than you can handle" is a half truth because not only does God not give you the bad things in your life, sometimes you really can't handle life on your own. You need to ask for help sometimes, and that's okay. That's why we're here, to help each other. Anyway, sorry for the novel. I just think this is a great idea and a great first article. I think I would have done that too--it's so hard to admit that you can't do something, especially when it's something you feel like you *should* be able to do. I can SOOOOOO relate, it's not even funny. :) It's hard for me to ask for help because as a teacher, I feel like it's my responsibility to know everything and do everything correctly. But, in all honesty, I DON'T, even if I pretend I do (maybe it's because as teachers, we pretend a lot with our students?). Anyway, asking for help from fellow teachers is really hard for me because I don't want to come across as incapable AND I also don't want to burden other teachers who I know have a lot on their plates already. That, and I also feel like I'm supposed to know everything and I don't want people to think that I can't do it--you know? Also, I am so pumped that you like this series! If you ever have posts to recommend or anything, I'd love to hear them! p.s. I also really love to hear your feedback. I always enjoy reading what you have to say! Control freaks unite, haha. I, too, like to do things on my own because I like to get things done the first time (which I have a feeling you might get!). :) And like you said, it's also because I don't want to have to "owe" people, even if they helped me just because. Also, I love that sermon you referred to! I've seen that quote everywhere and agree that it is a half truth. God knows that we can't handle everything on our own--that's why He's there and that's also why He's blessed us with other people--both in our neighborhoods and on blogs, too! Jesus is our obvious example of humility. It's twisted how insecurity and pride are so parallel. I'm feeling insecure so I turn around and show my pride etc. I feel like humility can look differently in a lot of situations but for me it comes down to this: humility is putting yourself below others but not in turn feeling sorry for yourself. Make sense? Sometimes in my life I have mistaken humility with self pity. Totally different! I've learned that through Jesus, humility is thinking about others but doing it in confidence! I use PicMonkey all the time but never noticed this font , way to go you for bringing out its beauty with yo' talent girl! Wow, that's awesome! Are you interested in teaching English/Literature, then? Are you thinking high school or older/younger? Wow, you really nailed it. Insecurity and pride definitely go hand in hand. And humility is also about thinking about others and doing it with confidence, too. So many wonderful definitions, friend! I honestly can't remember who all I sent the e-mail to! I could have gone back and checked, but if I don't get a response on things like that I just figure people are too busy. :) I'm just glad you're doing it HERE! Yay! If you need a break sometime once it gets going, I'd be more than happy to help you! BUT, you went for it and I want this to stay YOUR thing. I was just wondering if it was going to be weekly, monthly, or whenever an article jumped out at you? I think we humans have so much more in common with one another than we realize! We all wander around trying to cover up everything. All the while, we're surrounded by everyone else trying to do the same thing. I can't remember where I first saw or heard that...Maybe it was Pinterest! I always forget about the quote pages there. PS - I just came across another article on humility this morning. I thought you might enjoy it! St. Theresa of Avila said humility is living in the truth. Truth about God, ourselves, and others. First, I try to remember that God is God and I am not. Secondly, we live in the truth with ourselves by being just who we are and not trying to be something that we are not (I need to be humble enough to know that I have a gift, but not so prideful to be delusional about how gifted...). Finally, we live in truth with our neighbor through mutual respect, kindness, and acceptance. This is a really, really, really fun idea! I love it. Humility for me comes in many forms, but I see it most in my desire to always be the best at everything. I get very frustrated when I'm not good at something or when I can't easily figure something out. I think my way is best, and that causes problems with the people in my life, specifically Jordan (because he's around the most!). Reading Grace for the Good Girl really hit me hard in the area of humility, because I realize how proud I am and how much I don't NEED to work for God's love or grace because I already have it. Student Teaching taught me soooo much about my own pride! I had no idea how proud I was until I went through that time. It was ROUGH, but I'm grateful for it now! Very cool! We definitely need more teachers who are passionate about teaching AND the subjects they teach as well. Good luck with your studies! You nailed it. There's A LOT of humility that goes into teaching in general! All too often I act and pretend that I know and have it all under control, but then I'm reminded and humbled that I don't! And I would love to have you step in, if you'd like! I don't have huge plans for scheduling these posts since a lot of my posts are just "when something jumps out at me" kinds of things. But I'm always open to post suggestions and ideas! I get that way, too! I like to think that I can do everything and that I don't need help. It's hard to be reminded of our need for human help AND God's help, too. Thank goodness for grace! Also, I realllllly need to just start reading Emily's book! I still haven't had a chance to but now I realize how much I actually need it. :) Thanks for that little push to get started on it! I have serious book ADD so I haven't finished the last chapter or so but it was really, really good. I think you'd really like it! ok now onto hayley's post. i totally struggle with humility. i'm type-a and want all the things to be in order and to go smoothly and to be the one to get it done...so when i let something fall through the cracks, or fail, or whatever i feel like "i'm not good enough" and the truth is....no, no i'm not. and i'm not created to be good enough. I'm created to crave God, to crave perfection, to seek out the one who i need to fill the void...praise Jesus He created me to always be seeking Him out. Well, it's mine, haha (kidding). :) I was actually a little unsure about how this post series would be accepted but so far, so good! I'm excited to see what posts will end up being shared/chatted about next! I struggle to ask for help only if I feel like it reflects poorly on my independence. Basically, I don't like asking for financial help. It's definitely something I had to work on a few years ago, when I had just started a new job that didn't pay much, and my car died, and I had to get my own apartment, and it was just too much all at once. Other than that, I'm pretty good about saying I can't do it all. With my job, I keep telling my colleagues that no, I can't do the extra things they want me to. Or I tell them that if I'm going to take on a certain task, it won't be done on their deadline. Our first intern started last week, and my boss is letting me delegate so much to her. For the first few weeks, this will actually mean MORE work for me, since I'll need to train her and look over her work, but I figure the time is worth the investment. Oh I totally agree. This year a big focus of my life is to build community right where I am - so far it has been eye opening and such a blessing to accept all people in my life. It was definitely the best orientation but so relevant to our program and a great way to get to know each other in an out of the box way! So I'm a little late to the dicussion and brand new to your blog, but Kiki I love this idea. I guess I've just recently come to realize that blogging can involve a whole community, so I found this to be pretty cool. Thanks for sharing your idea! As to humility, shew I could use a whopping dose. Some days I think I'm doing pretty darn good, but then I guess that should be a tell-tale sign that I need some more. Like Hayley, it's usually my wonderful, well-meaning husband that inadvertently points it out. It involves some hurt feelings, a bit of pouting, and a good prodding by the Holy Spirit to get my attitude back on track. But I guess each of those (daily) reminders pushes us to accept reality and face life with a bit more humility. I love that you've discovered community in the blogging world! I so remember that moment when it finally clicked for me (as opposed to just seeing people talk about it allll time in their blog posts) and I'm glad you've found how much fun and cool it is! And girl, you and I both. I need a dose of humility every moment of the day. I also love what you said about needing those daily reminders, even if they hurt or push our buttons. I think those daily reminders really do help us face life with more humility! I absolutely LOVE this idea! I think it is fantastic. As for humility: I feel like my humility depends on who I am with. If I am with my family than I don't have a problem asking for help or if I'm with a close friend. But if I am with someone who I am not necessarily close with, than I have a harder time admitting I cannot do something. I do admit that I need to work on the true definition of humility - of not thinking I am better than other people, I struggle with putting myself higher than any other and then also thinking of myself lower than other people. I need to realize that we all are on the exact same scale of humanity, and that we are all viewed the exact same by God. Thanks, Olivia! It makes me SO pumped to hear that people are enjoying this concept and are as excited about it as I am. :) Yippee! And you made a great point about humility and how it's different for you depending on the person. Now that you mention it, it's the same for me, too! I definitely have a harder time asking for help from people I'm not as close with, too. I also get what you mean when you said that realizing we're all the same and are all made by Him. So true and something I need to remind myself of constantly!